We go to great lengths to provide Emerald Ash Borer Treatment to help protect our Urban Forest! The Emerald Ash Borer treatment has become a rising necessity in the Kansas City area as the growing risk of Emerald Ash Borer (EAB) continues to affects the plants in our area. As certified arborists, we have seen it all when it comes to plant care in the local area, and we are well-prepared to help you with this rising threat. There are several options to think about when you’re considering EAB treatment, such as: how long do you plan to keep the property? Soil treatment of Fall 2019 will control the Japanese Beetle year-round. At Hendrickson Tree Care, we can help you ensure your trees remain healthy despite the risk of Emerald Ash Borer threatening your plants, and we hope to enlighten you with the methods in which we can serve your needs. The Emerald Ash Borer beetle will likely kill every untreated green and white ash tree in the greater Kansas City Metropolitan area if action is not taken – and soon. This pest is already responsible for the destruction of millions of ash trees in North America – and trillions more throughout the world. In fact, this insect will become the most destructive pest in history, in terms of actual dollar loss to residential, businesses and municipalities. It honestly cannot be ignored. Interestingly enough, there are many who are still not aware of this menace, so we’re going to arm you with the information you need now. If you have ash trees and haven’t yet had them inspected, it’s important that you do so as soon as possible to know your options. This insect, at the present time, only affects ash trees and even if you’ve had yours regularly inspected, it’s always wise to keep abreast of current information. This may sound melodramatic, but trust us: it’s accurate. Do you need your ash trees inspected? The ash borer treatment is actually a very simple process when you go through a company, like, HTC. Ash tree treatment is necessary whenever you’re looking to rid yourself of the risk from the devastation that the Emerald Ash Borer beetle might bring to the ash trees on your property. This beetle has already affected millions of Americans, and we’re able to help you treat your ash trees so that the EAB won’t affect you! At HTC, we offer a new treatment for Emerald Ash Borer, and we’ve seen a lot of success as it’s helped numerous local residents get rid of the Emerald Ash Borer beetle from their property. EAB Treatment is aimed specifically at the plants on your property which pose the greatest risk. Emerald Ash Borer can be treated– you just need to apply the right technique so that the Emerald Ash Borer beetle won’t affect your plants! You may have come across some unconventional approaches to rid yourself of the Emerald Ash Borer on your property, and some of them work to some degree. When you notice Emerald Ash Borer tree damage, you must take the appropriate action as soon as possible. There is Emerald Ash Borer insecticide that is available on the market, though, we always want our clients to know that Emerald Ash Borer damage can be controlled if it is caught soon enough. The issue with EAB is that it affects so many different types of ash trees. Ash trees are one of only a few trees with opposing branches and leaves. An easy way to remember the main trees with this quality is by the acronym MADhorse (maple, ash, dogwood, horse chestnut). Branches may not always seem opposing if one has died or fallen off, so use caution. Look for compound leaves with 1 leaf and 7 leaflets and for the distinctive bark which has deep and jagged grooves. Do you notice any tracks and “bullet holes” in your ash trees? If so, you’re past due for treatment and the prevention from Emerald Ash Borer was not effective. You will need to treat your ash trees in one way or another. We urge you to contact us today so we can recommend the correct method to prevent and/or treat the Emerald Ash Borer on your property. When you need Emerald Ash Borer treatment in the Kansas City area, we are here to help you. By serving local residents for over 30 years, we have never seen such a rising risk of the EAB in our area, but it’s here. When you are looking for a qualified team to help rid your risk of Emerald Ash Borer, feel free to give us a call. We serve, both, residential customers and provide Emerald Ash Borer treatment for commercial businesses, too. If you are a client we have done work for in the past, then we will visit your property at no charge. If you would like an arborist to look at your ash tree or trees at a residential home less than 1/2 acre in size, let us know. Our arborist can determine if the value of the tree is worth the cost of annual or biannual treatment for a period of years. There is a $75.00 fee which is refunded back for any one-time treatment that is greater than $400.00 This fee covers an ash tree inventory we complete on your property. We measure, determine the worth of saving, advise on all options and give you a quote. Measure your tree(s) for diameter at breast height or DBH using the below method. Determining DBH for trees with multiple stems. Send us an email with your name, address and phone number, the location (front, NE, back, SW, etc.) and photo of each tree (if desired) and the DBH of each tree. At 4-1/2 feet above the ground, wrap a measuring tape around the trunk of the tree. Divide the measurement by 3.14 to get the diameter, also known as DBH (diameter at breast height). If you have a tree with multiple stems, measure the diameter of each stem. Feel free to send us an email with your name, address and phone number, the location (front, NE, back, SW, etc.) and photo of each tree (if desired) and the DBH of each tree. We will send you an estimate via return email based on your initial measurements and photos. If you approve the estimate we will treat your trees. For commercial businesses seeking Emerald Ash Borer treatment, we are pleased to announce our Commercial Property Program! Our Comercial Property Program is specifically designed for commercial property or large property owners with many trees on their grounds. This is a web portal program that allows us to inventory and “tag” each unique tree on your property along with it’s location and subsequently provide you a customized print-out with detailed treatments and status on each tree. If you would like to discuss how this specialized program works, give us a call at (816) 523-1181, or email joe@hendricksontreecare.com. Please review some of the common questions we receive from customers seeking EAB treatment. How effective are Emerald Ash Borer treatments? Many people call us wondering: do Emerald Ash Borer treatments work? As we say, Emerald Ash Borer treatment is effective when it’s executed by a trained arborist that knows how to treat EAB. Emerald Ash Borer treatment effectiveness relies on the expertise and implementation of the treatment. Our customers have found the treatment to be successful for their trees. When to treat Emerald Ash Borer? The sooner you can attack Emerald Ash Borer, the better. The most effective Emerald Ash Borer treatment is achieved in the prevention stage, though, it really depends on the situation. The best time to apply Emerald Ash Borer treatment is quickly as it’s discovered. If you follow the guidance we have provided, you should have no problem telling whether Emerald Ash Borer infestation has started to occur. Of course, a trained arborist can help you make the determination for what do once it is detected. Should you Save or Remove Your Ash? Determining the worth of a tree isn’t always easy. In the end, it’s up to you– the homeowner– to decide. Treatments are reasonable for trees of high value. If you decide not to treat, the next issue is to decide when to remove the tree. Do not let the tree die and then call for help. Ash trees become brittle soon after they die. This makes the trees more hazardous to life and property while standing – and also more difficult and expensive to remove. If you need an expert opinion, we’re here to give the honest facts. 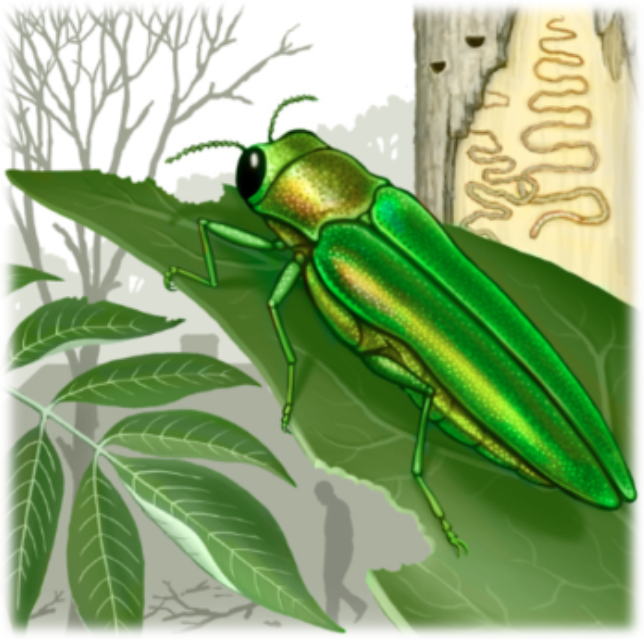 How to Identify Ash Tree Borers and Tree Damage? Because the EAB’s interrupt the phloem, nutrients aren’t able to travel to the top of the tree and the tree dies from the top down. If you see the D shaped exit holes in the trunk and dead foliage at the top, your tree has likely had EAB for 3 years and treatment may not be an option. Woodpecker damage is common with EAB infestation and trails are visible when the bark is pulled away. How to Determine the Value of your Ash? Does it provide shade to your home, lowering your utility bill? What is the value of the tree to the property and in curb value? Is the tree high profile and you could not possibly live without it? Is the tree in a favorable location? Does the tree have sentimental or historical value? These are all important questions in determining the value of your ash tree. We can help you make a sound determination and help you execute your plan to improve your condition. Are you ready to schedule an appointment and request a quote now?